Saute onion and hot dogs in butter until tender; pour into 2- quart casserole. 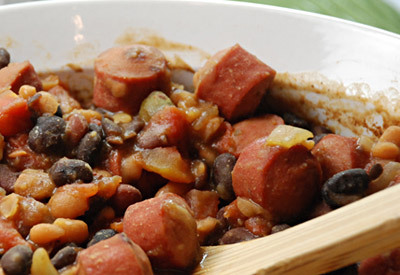 Add chili beans, pork and beans, black beans, tomatoes and chiles, brown sugar, mustard and celery seed; stir to combine. Bake uncovered for 40 minutes, stirring occasionally. Can be served as a side dish or as a dip.